In the 19th century, Horace Greeley was credited with telling young men to go West. If he were alive today, he might say, “go off the beaten path, traveler.” There’s no better place to take his advice to heart than Thailand. 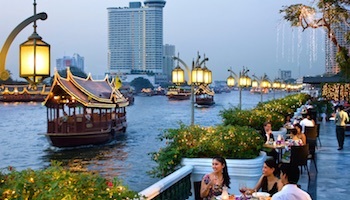 Get thee out of Bangkok and Phuket to places that are scenic, filled with wildlife or offer deserted beaches on less developed islands. 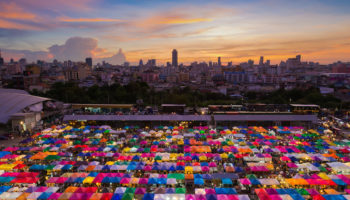 Whether you’re exploring traditional fishing villages or ancient temples, there are plenty of underestimated destinations in Thailand just waiting for inquisitive travelers. Accommodations may not always be luxurious, but that’s part of the adventure when you get off the beaten path. Ko Yao Noi is a relatively unspoiled island in Phang Nga Bay despite being a 30-minute boat ride away from the glitz and glamour that is Phuket. There are some resorts on the island, but budget accommodations also are available. Ko Yao Noi or “small long island” is mountainous. The east side of the mountains has beaches where you can swim and snorkel. The west side is a good place to see mangrove forests and rice flats. You can also take diving lessons on Ko Yao Noi or cruise the bay to other islands. The island is quiet, making it one of those destinations in Thailand to relax in a hammock. 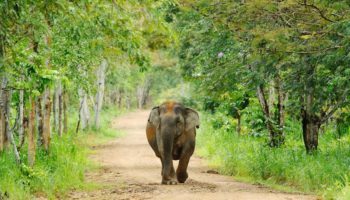 If you want to see wildlife in its native habitat, head to Khao Yai National Park, just three hours by car from Bangkok. Thailand’s first national park is home to elephants, barking deer, gaurs, macaques and bears. It also is home to about 300 species of birds, including Thailand’s largest population of hornbills. The best time to see reptiles is March or April when the reticulated python, Chinese ratsnake and water dragon, and crested lizard come out to play. Other attractions include a bat cave (three million live there), waterfalls (Haew Narok is the highest), camping and hiking trails. When you’ve got a sweet tooth, indulge it at Phetchaburi. The Thai city is famous for its desserts, especially khanong mor gaeng, a custard. 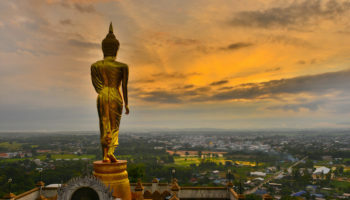 The capital of a province with the same name, Phetchaburi is one of the oldest cities in Thailand. A hill is a highlight of the city, mainly because the royal palace (Khao Wang) and a wat or temple sits atop it. Spelunkers might enjoy a visit to the Khao Luong Caves outside of town. One cave features Buddhist statues set among the stalactites while the other features an ancient tree in the middle. 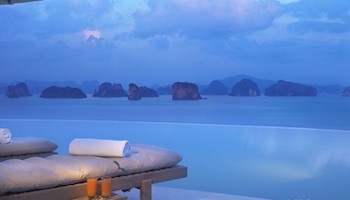 If you need some downtime on your whirlwind tour of Thailand, the island of Ko Kradan in the Andaman Sea just might be the ticket. Ko Kradan is a short, narrow island that’s part of Had Chou Mai National Park. Sunset Beach is a great place to go snorkeling in coral reefs that are close to shore of Sunset Beach. The island’s other main beach, Paradise, doesn’t have good snorkeling but it does have great sandy beaches for lazing on or beachcombing. It’s a great place to view other islands and the mainland. 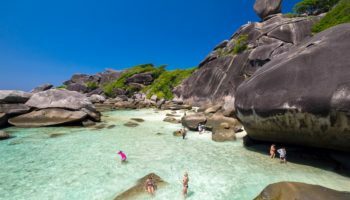 Thailand has many beautiful islands of which Ko Maak is one of them. 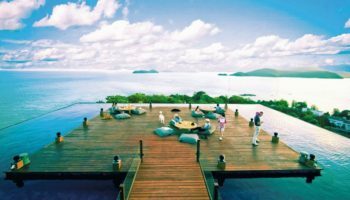 Described as a tropical paradise, this pretty island is located in the Gulf of Thailand close to the border with Cambodia. No less beautiful are the beaches and the crystal clear water surrounding the island. The center of the island is forested with rubber farms and coconut plantations. The large reefs make Ko Maak a good place to snorkel and drive if relaxing on super beaches gets too boring. You can also take lessons in Thai boxing and cooking. Note: Bring lots of cash as they’re no ATM on the island. 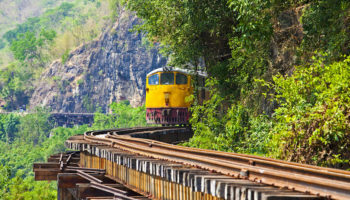 Located just over 150 km (90 miles) from Bangkok, Lopburi has long been a travel destination, most likely beginning with the Italian explorer Marco Polo who mentioned it in his book, Travels. The city is most well-known for its crab-eating macaques that freely roam the city and have earned the city the nickname Monkey City. They are especially prevalent around the Khmer temples and shrines, which in themselves are worth a look. A word of warning: These monkeys like to pick pockets and may attack you if they think you have food. Lopburi celebrates the Monkey Festival every November. Phimai Historical Park is a good place to see Khmer temples that are among the best preserved in Thailand. 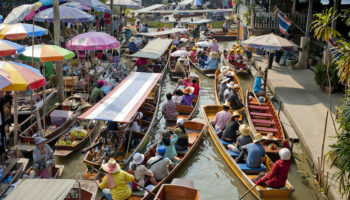 It has temples that are comparable to what you’ll see at Angkor Wat, but you won’t be fighting the crowds to see them. There’s a twist to the temples here, too: they were built by Hindus but in the style of Buddhist temples, though they still retain Khmer architectural characteristics. Most of the buildings in Phimai Historical Park wee constructed in the 11th and 12th centuries. Phimai Historical Park at the end of the ancient Khmer road from Angkor. Getting to Ko Muk (also known as Koh Mook), one of the larger islands off Trang Province, takes a bit of planning: only one ferry a day travels between the island and mainland. Once there, you’ll find the popular Farang Beach, which is the departure point for Tham Morakot, a cave that is accessible only at low tide. The cave, with its emerald green water, is the island’s most famous attraction. You’ll also find traditional fishing villages on the island. Ko Muk (the name translates as Pearl Island) offers a low-key lifestyle. Residents are predominantly Muslim, so visitors are asked to dress appropriately away from the beach. Not only is Sukhothai Historical Park an underestimated destination, it’s also considered a sacred destination in Thailand. It was the capital of the Sukhothai Kingdom from 1238. The historical park is surrounded by an ancient wall and moat. 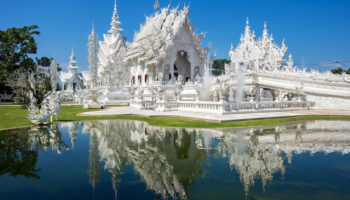 Located in northern Thailand, the park has 21 temples with the largest having 200 pagodas. Though it’s in ruins now, you can still see how the Khmer and Sri Lankans influenced the architectural styles of this medieval kingdom. The busiest zone is the central zone that is filled with temples, canals, ponds and vegetation, but the other zones also are worth a look-see. Located 100 km (60 miles) off the coast of eastern Thailand near Cambodia is the island of Ko Kut (also known as Koh Kood). It is a mountainous island with not a lot to do but lie in a hammock and gaze at the scenery – it’s considered one of the most scenic islands in Thailand. This island has nice sandy beaches and is sprinkled with waterfalls, the largest of which is Kling Chao. 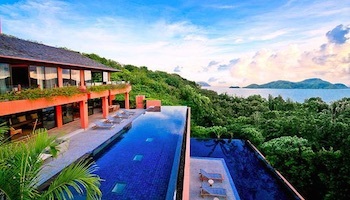 If you get a sudden burst of energy, you could snorkel or go kayaking, or take a walk in the jungle. The island also has several fishing villages such as Ao Salat and Ao Yai that are worth exploring.